It was going to be days of work. There, on a wall of our little brick rambler, the English ivy had grown out of control. Nearly all the way to the roof, a great thick mass of it, with tendrils and growth extending out two to three feet from the side of our house. What had first looked like our house was rocking a lovely-English-cottage-look had started looking more like we were going for Abandoned-Ruins-of-an-English-Cottage-after-a-Global-Pandemic. Which isn't the best look. It had to come down. I waited the summer out, because, well, there were birds nesting in it, and I'm a softie. The idea of dislodging a nest and seeing sad little doomed chicks was motivation enough to procrastinate a while. But once the last brood of sparrows and chickadees had grown and flown, it was finally time. I'd cut the roots last month, hoping to weaken it. 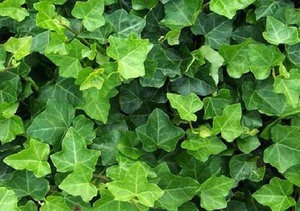 But English ivy is a fierce critter, and it happily continued to grow in the absence of roots and soil. No browning of leaves. No real change. It'd have to be mano-a-tendril. I figured days of painstaking removal, up and down the extension ladder, chiseling away at it with a flathead screwdriver and shears, peeling away the clinging rootlets inch by inch. For an hour, then another, I labored in the back of the house, up and down the ladder, doing just that. In the incongruous late September heat, I sweated and sweated. The plant was tough. It was going to take as long as I had thought. Then, dripping sweat and staring up at the verdant jungle affixed to the side of the house, I got an idea. I bundled and then pulled at a group of large vines at the base. Just a wee bit of tug of war, because I wanted to loosen it. Maybe that would work faster. More came down than I expected. One particularly large clump peeled away from the wall, all the way up, the vines borne down by their own weight. They were all woven up together, a thick mat of interconnections. So I made a larger bundle of four or five of the largest severed taproot vines I could find. I bound them together with a heavy rope. And then I pulled. Some came away. And pulled a little more. There was the sound of rootlets rending, as thousands of them failed. And then really put myself into it, heaving and tugging, worrying it back and forth like a terrier. My efforts and the weight of what I'd torn loose combined. And the entire wall peeled away in one giant mass, like flesh peeling from a particularly bad sunburn. Like a green glacier calving. What had to be half a ton of it, crashing down in a cloud of dust and pollen in which I blinked and coughed. I stared at what I'd done. Well, sort of done. Almost nothing remained on the house. Once the weight of the great interwoven edifice of ivy started working against it, the collapse was startlingly sudden. Almost dangerously sudden. There's a metaphor in there somewhere, I fear.